In a breathtaking debut drawing on complex science and recently discovered deep-sea biology, Kent Lester has married fast-paced narrative and cutting-edge, reality-based science to produce an edge-of-the-seat thriller. A seemingly random murder off the Honduran coast leads scientist Dan Clifford to a massive corporate conspiracy. Illegal, automated, undersea operations have unwittingly awakened a primordial organism that turns host organisms into neurotoxin factories, wreaking havoc with aquatic life and the nearby human population. This maleficence threatens to trigger a worldwide outbreak that could end in human extinction, the Seventh Sun of ancient myth. When the CDC and the full resources of the U.S. biological threats team fail to uncover the source of the devastation, Dan and a brilliant marine biologist, Rachel Sullivan, must plumb the deeps and face an unimaginable, ancient horror in the murky depths. It’s up to them to stop this terror before a determined multi-national corporation unleashes death on an unsuspecting world. This is one of the most entertaining, well written books I’ve read in a long time. The Seventh Sun is a little slow at times because of the set up that went into the plot and concept but it wasn’t boring at all. This book was such a fun adventure and so unexpectedly great. I loved the writing style and all the thought that went into this story. It was clear that the author put a lot of time and effort into creating the plot, which I loved so much. It was complex without being confusing and incredibly well written. I was never able to become fully emotionally invested in the characters but I still really liked them. I really enjoyed reading from the main character’s perspective. 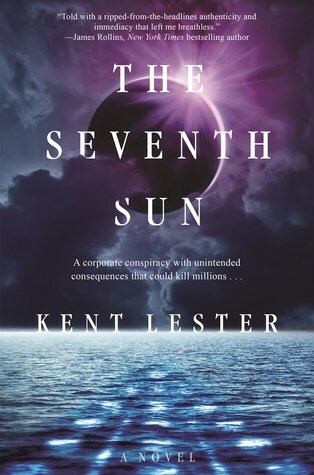 Overall, The Seventh Sun was a great read. I can’t stress enough how entertaining I found this book to be. I read it in just a couple of days because I never wanted to put it down.